Wow...reviews have been all over the ballpark in regards to battery life. They are anywhere from "subpar" to "more than adequate" to "surprisingly good". The Wall Street Journal reviewer said he used it for web browsing, email, etc all day and had 25% battery left at midnight. Another reviewer said web browsing lasted about 4.75 hours. Most reviews have said it goes about a full day without needing to charge. I heard the same about the 920. I find it hard to believe any phone getting a full days charge under heavy use, which I'm sure they are. Also, there are so many variables. Signal strength, ECT... The snapdragon is a pretty efficient processor so I'm sure these phones will be fine. Maybe the razr maxx will last a full day with heavy use but I don't think any other will. Perhaps we have a different definition of heavy use. Nice find on that chart. 4 1/2 hours isn't terrible but isn't great either. Better than my Galaxy Nexus. I'm not sure what my trophy gets but I'm pretty sure it's shy of the 8x. How does the iPhone 4S only do less than 5 hours of browsing and the iPhone 5 does over 8? That doesn't seem right. Sure seems like it. Unless Verizon finds a way to sneak a bigger battery in lol. You'll have to charge it at the end of the day but its not that bad. That's what I'm wondering. I wonder if this is in a controlled environment. Weak signal strength is a battery eater so that could explain it. I saw that chart earlier today and pretty much disregarded it...nothing adds up. 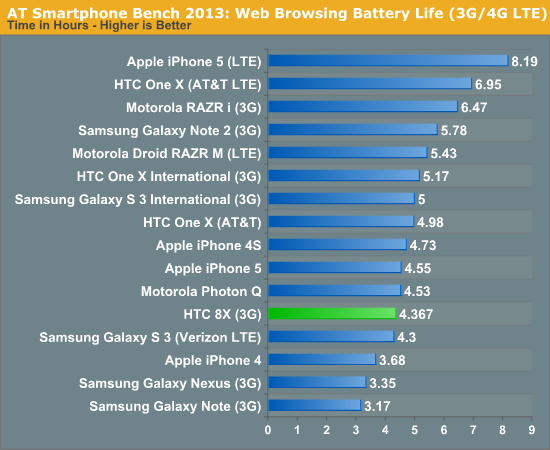 The iPhone 5 on 3G gets around 4.3 hours...yet on LTE it nearly doubles to 8.1 hours? Huh? BTW, I currently have an iPhone 4 on Verizon...the chart puts it's battery time near the bottom (3.68 hours). I do a TON of web browsing, email, text, talk, FB, etc...it will certainly go well beyond 3.68 hours before needing to charge. When I had about 4 hours hands on with the phones, I depleted about 45% of the battery. This was on LTE browsing the web, watching movie trailers, using a ton of location based features, setting up Kids Corner, etc. I cannot see battery life being an issue here. Engadget said it lasts a full day of regular usage no problem. I trust Engadget because their always pan out in real life. My Intuition is exactly how they described it. Same with my Razr, Rezound, Curve 9370, and every other phone I've carried. I just did my own 1-hour web browsing test with my iPhone 4. I charged it to 100% and began web browsing, Facebooking and watched 2, 10-minute YouTube videos. I had 88% capacity after 1-hour. At this rate I could go over 8 consecutive hours. In my opinion it's the best launch WP8 device. Is that 4 hours of pretty much continuous use? If so then that's good news. I'm not too worried about the battery life.